Growing Meadows: A new take on Hope - Expect it! One of my passions is Bible Journaling. If you dont know about it I encourage you to check out the Illustrated Faith Blog and the Illustrated Faith Bible Journaling Community on facebook. I wanted to share a page from my Bible today and explain the truth God revealed to me that inspired the art work. I have found when you spend any length of time studying The Word, especially in small group settings, you begin to realize how limited the English language really is. Generally speaking, many words we use on a regular basis have multiple meanings in Greek and Hebrew. The Greek uses many different words with different meanings which we translate as a single word with 1 or 2 English meanings. According to the Lexicon the Greek word translated here in Hebrews chapter 6 as "hope" is "elpis". A truer English translation of the Greek "elpis" is EXPECTATION! Friends, go ahead and take a minute to reread Hebrews 6:13-20. 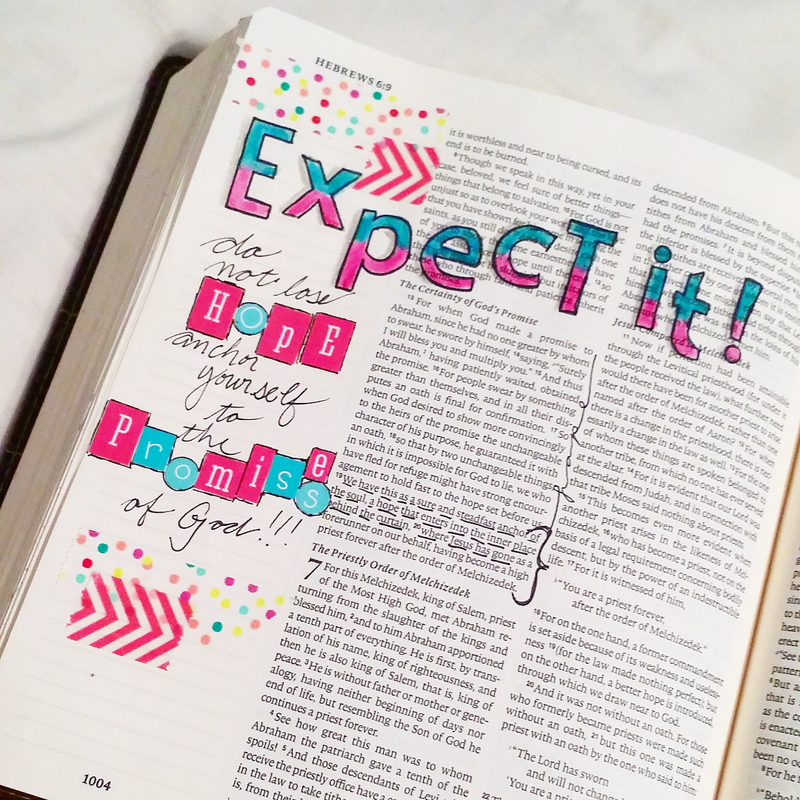 Change the word hope to expect or expectation! This is a paradigm shift! EXPECT Jesus to show up and keep His promises! "We have this EXPECTATION as an anchor for the soul." Anchor yourself to His promises. EXPECT IT!!! What promises has God kept for you?